Monday, September 19, 2011 at 2:01 am. Netflix’s latest move to get its customers to forget DVDs is to rename its DVD service: Starting in a few weeks, it will be called Qwikster, and will also include a videogame rental option. The first move was to separate the two businesses. Now Netflix is changing the name of the old service and giving it a CEO of its own, long-time Netflix exec Andy Rendich. 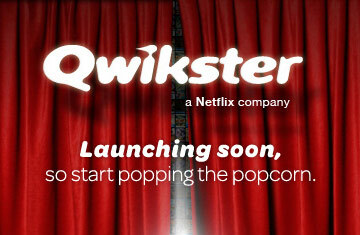 Further down the road, I wouldn’t be surprised if Qwikster breaks off completely from Netflix, is sold off to another company, or merges with another DVD service, like Redbox. Why is this happening? Because the future of Netflix is streaming videos. Period. Not mailing them to your house via the U.S. Postal Service, but delivering them to your TV and devices over the Internet. Commenters on the post are already bashing Hastings (and, admirably, he’s responding). One solid point is that it would be better for the DVD and streaming sites to share a user’s reviews and ratings, for the best recommendations and overall simplicity. Yes, there will be some awkwardness, and people don’t like change. But remember: The whole point is to move people off discs as quickly and completely as possible. Netflix has already said that DVD shipments have likely peaked. Now it needs to wind that business down and bet everything on streaming. This is pretty bold move, and things could even get uglier and less certain for Netflix in the short-term. But ultimately, it’s the right decision, and Netflix investors should be happy they have a CEO who is actively building for the future, and not sitting around, waiting for someone else to take the lead.